Hi I am not very good in the kitchen, so I am looking for a gloop recipe that really spells things out, such as measurements, cook times, etc. Something like you would see in recipe form. I am also looking for a gloop that is for parrots, and then I think I can tailor it for Bean needs based on the ingredients Pajarita would most benefit a Blue Front with Fatty Liver Disease. So if anyone has a link to such a place (if it exists), I would appreciate it. Thanks. Get a box of Kashi 7 Whole Grains Pilaf (http://www.amazon.com/Kashi-Whole-Grain ... ashi+pilaf) and cook all three packages in microwave according to the package instructions. You can add everything still frozen, just make sure there are no 'lumps' of many stuck together, and then freeze in individual baggies with a daily portion (it should be about 1/2 cup). The final product should be 50% grains and beans and 50% veggies but, like I told you before, at the beginning, you need to start with only grains and corn, then add the peas and carrots, etc. until he gets used to eating everything. Thank you AGAIN! Bean is not wanting to eat hardly anything, except thing he should not have. But he is talking, preening, etc. He at least does have an appetite, albeit for bad things he cant eat. I got him to eat some carrots just now by letting him watch me eat them first. I tried this with his pellets but it did not work first attempt. I am going to gather all of these ingredients (many by internet im rural) now. 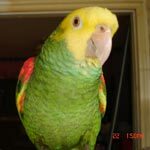 Bean always liked Millet Rice Cereal by Natures Path, I dont know if that would be ok for him or not? I will be in touch. THANKS AGAIN. They love grapes. Rambo peels his. Myrtle sticks it in her top beak and scrapes the inside out. Pajarita, you told me not to give them people cereal. I have been using whole grains and cooking them. Thanks. He does like grapes. I found the Kashi to make gloop..
Great! Now you can cook the packages of grains, drain and rinse thoroughly a can of small white beans and mix them together and serve this to your bird for breakfast with a sprinkle of what he will eat on top of it. This is how you begin to transition them from a poor diet to a good one. liz wrote: They love grapes. Rambo peels his. Myrtle sticks it in her top beak and scrapes the inside out. Correct, people's cereals are usually fortified with iron which is bad for birds. The Kashi pilaf is not cereal, it's just a mixture of whole grains. Okay, that is much better but it will probably take a year to get through all these bags of grain. Liz, you might want to check on the prices because the bags of whole grains that you bought may be cheaper than the pilaf ounce for ounce. I was told that a store 45 mile away had the Kashi Pilaf. When I got there, they did not have it. The box's I had coming are not going to be here until Friday. I did find the Healthy Nut bread, and he did eat some, and likes it. He also ate some carrots, red pepper, and green peppers cut up and mixed yesterday. But mostly carrots. I cant find the Kashi anywhere. I did buy flax seed(milled and non), the red winter whole grain flour, lentils, and barley. I dont know if these grains would work as a temp fix or not.I also have Quinoa. I found everything on the vegetable list except butternut squash(any squash), I guess its out of season. Not even frozen could I find it. I could not find white beans. I found Great Northern Bean, but not anything called white beans. If anyone has seen them called something else please let me know. I have been getting Bean to take his medications hidden in a teaspoon of Yoplait no fat yogurt. I hope this is ok, because its working. I know its both people food and a dairy product, but I dont want to towel him. Vet told me Greek yogurt but he hates it. Thanks.